2739 Se Eagle Drive Port Saint Lucie, Fl 34984 has been sold. You can view available homes in Port St Lucie. 4/3/2 POOL HOME IN DESIRABLE SOUTHBEND ACROSS FROM C24 CANAL. HOME WAS FORMER MODEL!! !UPGRADES GALORE. CORNER LOT WITH DOUBLE PAVER DRIVEWAY. VOLUME 13FT CEILINGS THAT ARE DOUBLE COFFERED IN FAMILY ROOM, DINING ROOM AND MASTER BEDROOM. SPLIT BED ROOMS. UPGRADED KITCHEN AND BATHROOMS. STONE COLUMNS AND EXTRA WIDE CROWN MOLDING. FRENCH DOORS LEAD TO A FULLY PAVED SCREENED LANAI W/COVERED TRUSSED PORCH AND WATERFALL POOL. WIRED FOR SURROUND SOUND IN EVERY ROOM. POOL ALARM AND CHILD SAFETY FENCE. BURGLAR ALARM. SURROUNDED BY MATURE PALMS AND FRUIT TREES. 2739 Se Eagle Drive located in Port Saint Lucie, FL is a single family home with 4 bedrooms, 3 full baths and 0 half baths.The Home at 2739 Se Eagle Drive was built in 2001 in Port St Lucie and offers a 2 car garage. This Port St Lucie Home offers none. 2739 Se Eagle Drive Port Saint Lucie, Fl is currently listed for $399,900 under the MLS# RX-10495063. 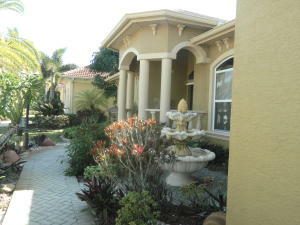 This Home has been put on the Port Saint Lucie MLS system and currently has a status of SLD. Port St Lucie in Port Saint Lucie is really a wonderful community in a great city. If you like the beautiful Port Saint Lucie location but you are not sure about this community. You might like one of the other local communities like South Port St Lucie or Pga Village or Vikings Lookout or Sabal Creek or Treasure Coast Airpark that are located here.